Chilli and Quiz Night – 15th November | Holly's Footprint.. 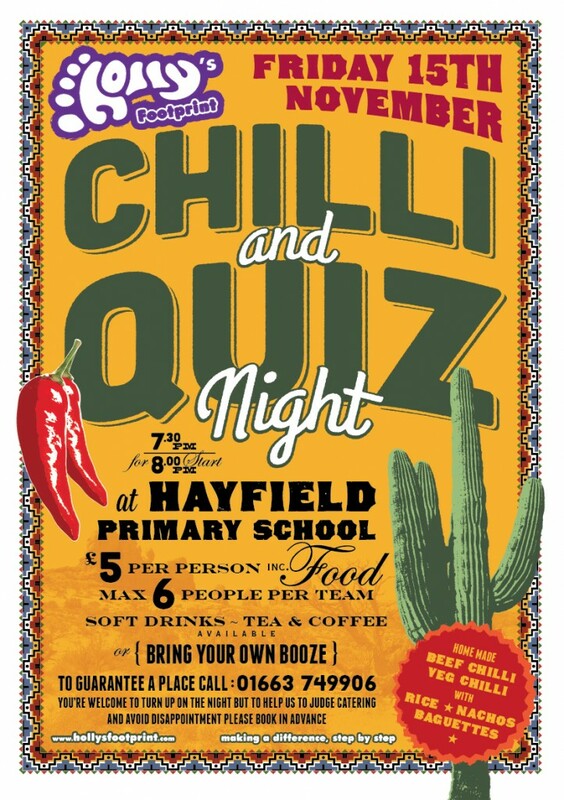 Here is the poster/flyer for our Chilli and Quiz Night that we are holding on Friday 15th November at Hayfield Primary School. It costs £5 per person which includes food and we can have teams of up to 6 players. Kick off is at 7.30pm for an 8pm start. We do have limited space so we’d recommend booking in advance… it will also help us work out how many people to cater for. Give us a call on 01663 749906. Soft drinks, tea and coffee will be available but should you fell like something a little stronger to fortify your spirits you are welcome to bring along a tipple to two of your own. It promises to be a fun night out so hopefully we’ll see a lot of you there. If you feel like spreading the word about this event please click on the image and print off a copy. Thank you.